CYMA User Portal allows online access to CYMA reporting from AP, AR, GL, and Payroll. The CYMA User Portal allows web based, user access to CYMA data and reporting. 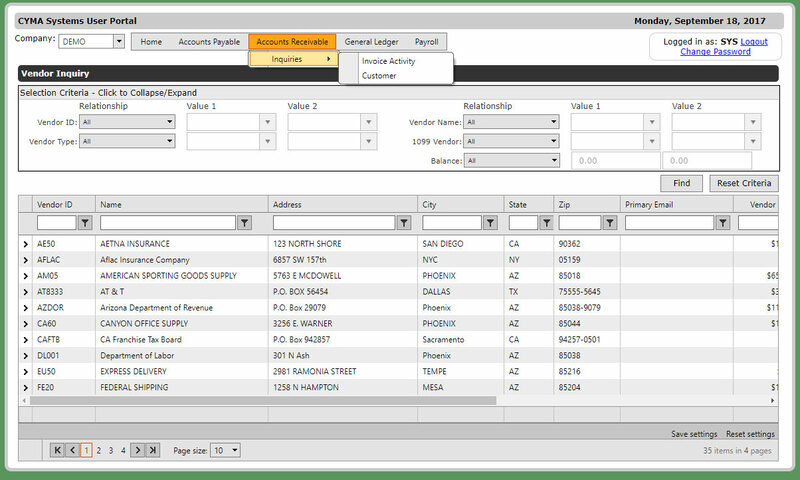 The CYMA User Portal consists of a series of powerful inquiries for Accounts Payable, Accounts Receivable, General Ledger, and Payroll data. The User Portal is hosted on a server, but can be configured for available from a web browser accessible from anywhere! Current Software Maintenance users (with Version 17 and Actian PSQL 12) can receive this product at no charge. Request a User Portal Serial Number here and CYMA will send you a license code and download for the product. Pre-recorded webinars are available in the Online Learning Center to help illustrate the benefits of using the User Portal system for providing web based access to CYMA information. * Actian PSQL v12 and CYMA Version 17 are required to use the User Portal. Additional Actian PSQL users and consulting may apply. Contact your CYMA Representative with any questions.